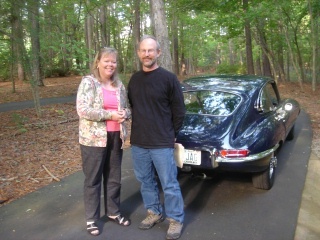 Jaguar Restoration – One wife’s perspective. “Well, you can’t say that the warning signs weren’t there from the beginning,” my mother reminded me recently as I pondered the amount of resources consumed in the name of Jaguar restoration. Of course she’s right, I really shouldn’t be surprised that it’s come to this. In the first months of our dating history, Harvey invited me to dinner at his apartment. I wasn’t necessarily expecting candlelight and roses, but I wasn’t expecting a carburetor rebuild spread all over the dining table, either. So, why Jaguars, anyway? Over the years, we’ve had Porches, BMWs, Volvos, Volkswagens and other fine, and not so fine, cars and trucks. A couple of them were actually new and ran reliably. Of course, there’s the easy answer that it’s the car of choice for a well-planned midlife crisis. The E type from the sixties seems to be the quintessential symbol of virility. Although girls may not notice just how well Harvey’s rear end shapes his Levis anymore, they will definitely notice that car. However, there’s still the matter of getting a car running in order to impress anybody. Based on the current rate of progress, I anticipate that the first car will pass a DMV inspection about the time that same agency revokes Harvey’s driving privileges and our children consign us to an assisted living facility. Needless to say, he does not appreciate my questions regarding estimated dates of completion..
To be honest, I probably have to bear some of the responsibility for the broadened scope and project escalation over the past several years. Like many other important turning points in our married life, it didn’t come without a fight. During a marital summit meeting regarding the environmental impact of solvents and the aerosolized by-products of chrome electroplating in the basement, a treaty was hammered out and Harvey agreed to put the restoration on hold and build a new garage/shop in which to work. As a result, we have the only three-story garage in New Hill and he feels it is his solemn duty to fill the space. The only reason he currently has two cars under destruction and not three is due to very tough negotiating on my part which kept the size of the garage from exceeding the size of the house. I think on some level, Harvey is a little envious of those soul-mate couples featured on various Speed TV programs. I’ve seen them too, where the wife gazes adoringly at her car guy husband, who can do no wrong, while discussing the benefits of spending $100,000 of their life savings in order to create a museum quality car worth $75,000. Reality at our house is not quite as romantic. My automotive responsibilities as soul-mate are very limited. I sit in the driver’s seat and steer when the car is pushed or pulled from one point to another. But, most importantly, I am in charge of Quality Control. As a veterinarian, I am trained to notice anything that deviates from normal. As a result, if there is one square inch of orange peel to the newly painted surface, irregularity, or asymmetry anywhere, I feel compelled to comment. This typically results in two things; initial anger and resentment from Harvey that I don’t notice the 99.9% of what is right followed by acceptance and somewhat grudging repair of the problem. Unfortunately, I’m not as effective as I could be in my QC role. I put in long hours at work and so he’s usually able to get a lot covered up with body filler before I have time to wander through again on another inspection tour. I know Harvey has visions of us retiring and leisurely touring the country in one of his restored cars. He talks about taking the car to the track and attending rally events as a couple. It’s not really my dream, but in the interest of marital harmony and pretending to be supportive, I don’t feel that it’s worth debating. It’s kind of like my various quilting and knitting projects that never get finished. We enjoy the creating as much or more than the completion. Chances are I won’t have to go on long trips in a car lacking basic amenities and he won’t have to wear a sweater that’s out of style by the time it’s completed. By the way, I’m looking at that instrument panel more closely and the key cylinder appears to be turned about 30 degrees to the left. Wouldn’t it look better if the key slot was straight up and down just like the toggle switches? On closer inspection, the little plastic toggle handles appear to be slightly warped, too. They look like they need an orthodontist instead of a mechanic. I’ll have to remember to mention that to Harvey. It will give us something besides solvent fumes to talk about tonight.